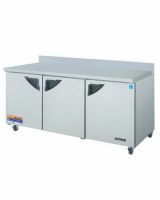 Efficient Refrigeration System : M3's solid door refrigerators are designed with oversized and balanced (CFC Free R-134A) refrigeration systems. These include efficient evaporators and condensers for faster cooling and greater efficiency. Ergonomically Designed Doors : Customers' fatigue fades away with easy grip handles and doors that open effortlessly. These features along with self-closing doors make this the ultimate choice in customer convenience. ABS sheet door liners resist water condensation with thermal efficiency.